Kaleidoscope is the first in a series of ten volumes to be published over the next ten years as a complement to an online hypermedia edition of the Collected Works of P. K. Page. Listed chronologically by date of composition, the poetry in Kaleidoscope is fluid, wondrous and technically exquisite, drawing on subjects great and small, and it offers a comprehensive look at one of Canada’s most beloved and brilliant poets. 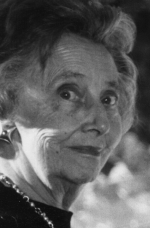 The name P. K. Page is synonymous with ‘artist’: she won the Governor General’s award for poetry in 1957, was appointed a Companion of the Order of Canada in 1999, and her paintings are found in the permanent collections of the National Gallery of Canada and the Art Gallery of Ontario, among others. Her voice is luminous, her focus grounded in reality, and her mastery of poetic form is nigh unmatched in Canadian literature. 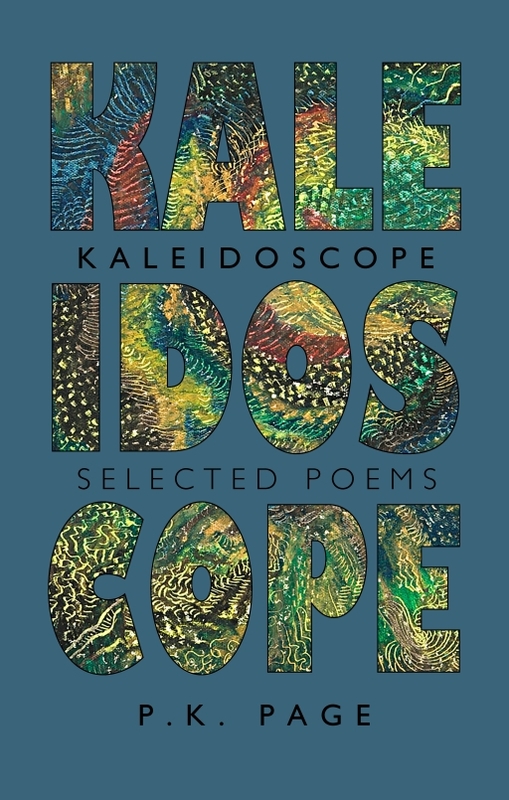 Selected by Zailig Pollock, the poetry in Kaleidoscope is elegant, technically exquisite and full of marvels, and the chronological presentation reveals Page’s growth as a poet over her long lifetime. This collection is more than a mere re-publishing of previous work; Kaleidoscope includes poetry hitherto unpublished, and Page involved herself with the process of editing certain pieces until her death in January 2010. 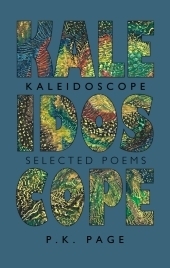 Kaleidoscope: Selected Poems is the first in a series of volumes to be published over the next ten years as a complement to an online hypermedia edition of the Collected Works of P. K. Page. The online edition is intended for scholarly research, while Kaleidscope offers a beautiful and inspiring text to be enjoyed by those who love and wonder at the achievement of Canada’s greatest poet. He loved himself too much. As a child was god. Could I Write a Poem Now? There’s something in this collection to spark new interest, remind those familiar with her well-loved lines and introduce readers to her evolving style over the years. From the dazzling word-work of the early poems, to the gorgeous complexity of her glosas, her skill at fitting line to image and colour to sound is nothing less than stellar -- especially in the way she could make rhyme steep in the vowels and tickle at the back of the mind. Musicality and understanding of rhythm pervades her work. From her beginnings as a poet with an imagistic approach, to the broadening and deepening of the later years, these spiritual, seeking, overcoming poems are compelling. Privileging natural imagery and a disillusionment with contemporary obsessions, the poems reveal a poet who rarely falters. What the book presents is a poetic tour de force. It illustrates how firmly accomplished Page’s work was from the beginning of her career. Randall Jarrell famously declared, ‘‘A good poet is someone who manages, in a lifetime of standing out in thunderstorms, to be struck by lightning five or six times; a dozen or two dozen times and he is great.’’ Lists of P. K. Page’s lightning strikes will differ from reader to reader -- mine would include, at the very least, ‘‘After Rain,’’ ‘‘Another Space,’’ ‘‘Arras,’’ ‘‘Beside You,’’ ‘‘Cry Ararat!,’’ ‘‘Deaf Mute in the Pear Tree,’’ ‘‘Evening Dance of the Grey Flies,’’ ‘‘Macumba: Brazil,’’ ‘‘My Chosen Landscape,’’ ‘‘The New Bicycle,’’ ‘‘Planet Earth,’’ ‘‘Presences,’’ ‘‘Stefan,’’ ‘‘The Stenographers,’’ ‘‘Photos of a Salt Mine,’’ ‘‘Stories of Snow’’ -- but most readers would agree that few, if any, Canadian poets have been ‘‘struck by lightning’’ more often than P. K. Page. sweet water, head to foot. melt of chinooks. A musical weather. watery with flutes. And woodwinds. The wonder of water in that icy world. is proved, in its melting, ice. The hard frost that locked the lovely waters of Page’s poetry in Brazil was to last until the very end of her years in Mexico when, in the central chinook moment of her career, with ‘‘a sudden ... bouleversement’’ (‘‘Questions and Images’’ 41) ‘‘solid walls dissolved’’ (‘‘Questions and Images’’ 40) and poetry soon began to flow again, as it would for the rest of her life. The period of silence which ‘‘Could I Write a Poem Now?’’ portends is the pivot around which Page’s career turns. The poet who falls silent in Brazil and the one who finds her voice again in Mexico both created work of the highest order, but in vision and language the poetry of the earlier and of the later Page could hardly be more different. All readers of Page recognize this difference, but to explain its origin is a different matter. The most illuminating accounts of the poetry of the early Page are provided by Brian Trehearne and Dean Irvine. Although their perspectives differ, both see Page’s poetry of the forties and fifties as the product of a tension between opposing pairs of principles variously defined: personality and impersonality, interiority and exteriority, subjectivity and objectivity, multiplicity and wholeness. Trehearne emphasizes ‘‘the aesthetic dimension of her crisis’’ (95). In his account Page is struggling with the legacy of the ‘‘accumulative aesthetics’’ (92) of imagism, attempting to arrive at a ‘‘new attitude to the relation between the individual image and the whole poem’’ (64). Irvine presents a gendered reading in which Page’s struggle is between an ‘‘objectivist, impersonalist ... masculinist modernism’’ dominant in the Montreal milieu of the forties where she first found her voice, and a ‘‘subjectivist, personalist ... gender-conscious poetics’’ (130-31). And both convincingly argue that the tensions they identify in such masterful poems as ‘‘The Stenographers,’’ ‘‘Photos of a Salt Mine,’’ ‘‘Stories of Snow,’’ ‘‘The Permanent Tourists,’’ ‘‘Arras,’’ ‘‘Giovanni and the Indians’’ and, especially, ‘‘After Rain,’’ eventually led to an impasse. do what I will -- encumber its pure line. Although ‘‘After Rain,’’ provides us with a powerful dramatization of the tension between the opposing impulses at the heart of Page’s poetry of the forties and fifties, in the end it leaves us ‘‘no closer to the causes of Page’s middle silence,’’ to an understanding of why it is that ‘‘pairs cannot be reconciled’’ (Trehearne 105, 45). The key to the ‘‘enigma’’ of ‘‘unsynthesized dialectical pairs’’ (Irvine 131,132) is provided, in retrospect, by Page herself. a bolt of lightning in its naked hand. ... the two -- with a third. Seeing Page’s career in the forties and fifties in terms of a conflict between pairs of opposites will take us only so far. It is only when we adopt a ‘‘Triclopian view’’ and see the ‘‘two -- with a third’’ that we can hope to grasp the larger pattern of Page’s loss of her poetic voice and its recovery during the period spanning her years in Brazil and Mexico. Page leaves us in no doubt as to the nature of the ‘‘third,’’ when she describes the transformative moment that marks the end of her period of silence. outgrows its necessity, mine had increased. came, in typescript, my first introduction to Shah. Something in me was stilled. Some thirst was assuaged. I looked deeper and deeper in. The extent to which Page struggled to ‘‘turn consciousness off’’ can be seen in her most important work preceding her poetry of the forties, The Sun and the Moon, which she completed in 1940. At the core of this novella is the theme of the ‘‘sweet ecstasy’’ of ‘‘breath-taking communion’’ (7) repeatedly experienced by its protagonist Kristin. Kristin has the gift of ‘‘empathy’’ (107) which enables her to enter into the being of whatever she perceives. But, to her horror, she learns that in entering into the being of Carl, the man she loves, she drains him, succubus-like, of his vitality. When Kirstin imagines this process, she envisions ‘‘the slide of a glass in a phial which held two acids apart ... [being] destroyed by the acids and ultimately [bringing] them together to react’’ (119) -- a kind of terrible parody of the melting of the glass partition in ‘‘Another Space.’’ Her solution is to transfer her spirit into a tree and thus save Carl from being absorbed into the ‘‘undivided mind.’’ The vision of spiritual wholeness, which Page would eventually come to celebrate, is here seen as a source of ‘‘terror’’ (119). At this stage of her life, Page has no way of making sense of it and there is nothing in her Canadian social or cultural milieu to help her. Page’s poetry of the forties and fifties, then, is marked not only by very real tensions between the two poles of the sensuous and the rational, but by the continued denial of the ‘‘third’’ -- the spiritual. It is when this denial becomes impossible to sustain (‘‘I was starving’’) that Page falls silent; it is only when her spiritual hunger is finally ‘‘assuaged’’ that her silence can be overcome. The deeply moving drama of loss and recovery which reaches its dénouement at the precise chronological midpoint of Page’s life, takes place in three countries, each of which has its unique role to play in the evolution of her ‘‘Triclopian view.’’ Nothing had prepared Page for the life of an ambassador’s wife that she was to embark on with her husband, Arthur Irwin; but, in retrospect, there seems to be an inevitability about her three-part physical and spiritual journey over these years. Australia, the first stage of this journey, ‘‘fascinated and appalled’’ Page, as a kind of distorted mirror in which she could view the Canada she had left behind. It was primarily the rational, critical side of Page’s nature that Australia engaged, as she grappled with her place in a deeply conformist and self-satisfied society of ‘‘ordinary people [who] understand ordinary things’’ (‘‘Social Note’’). It is in Australia that she produced some of her most intellectually challenging works -- poems such as ‘‘Arras,’’ and ‘‘After Rain’’ -- in which she analyzes with great precision the increasing, and increasingly disturbing, gap between her art and the world around her. In a curious reversal of the ‘‘magic of melt’’ of wintry Calgary’s chinook, tropical Brazil is imaged as ‘‘green warm water dense / as a cube of green glass’’ (‘‘The Heat and Weight of It,’’ 27-5: 8) in which Page feels trapped and isolated. In another related image of isolation and entrapment, she sees the ‘‘whole green world’’ of Brazil as a ‘‘chrysoprase,’’ a kind of precious green stone, ‘‘crystal and spherical / silent as the hole in a head within.’’ At a loss for words, she sees only one possibility open to her: ‘‘Paint it’’ (‘‘This Whole Green World,’’ 27-5: 4). In Brazil, the poet P. K. Page becomes the painter P. K. Irwin, and, for a time, finds in this new art a release for the creative impulse that had been denied her as a poet. As we have seen, Trehearne identifies the central challenge which Page faced in the forties and fifties as ‘‘the integration within a coherent ‘whole’’’ of an ‘‘accumulation of brief images’’ (77, 61). In Brazil, this challenge continues to vex her as a poet: ‘‘It is not enough to describe it / who wants a list?’’ (‘‘There Should Be More to Say,’’ 27-5: 11) -- but not as a painter. Freed of the demands of the intellect for a larger pattern of order and meaning, she begins to record, in drawing after drawing and in painting after painting, the images that ‘‘pelt’’ her from every direction (‘‘Questions and Images’’ 35). Page’s joyous acceptance of the sensuous side of her nature is reflected in her diaries of the time. Compared to the Australian diaries, in the diaries of this period -- and even more so in the Brazilian Journal based on them -- there is little of the pungent social commentary that previously had so engaged her critical intellect. There can be no doubt of the continuing, lifelong importance of the Brazilian years to Page. Cullen, her alter ego whose life journey she traced in a series of poems over a period of seventy years, ends his journey with a memory of Brazil. And, in her own life journey, the last work that Page completed was a version of a Brazilian fable. But although it is impossible to overestimate the importance of the Brazilian years, they were a passing phase. By the end of her time in Brazil, there is evidence both in her paintings, which are becoming more complex and disciplined, and in her diaries, that what Brazil has given her -- permission to acknowledge and celebrate the sensuous aspect of her nature -- is not enough. She writes ‘‘there is a side of me which will always react to this place, a sensuous side ... which loves all that loves the sun. ... but it is as if one dimension here is missing--the third, I think‘‘ (P. K. Page fonds, 113-16). Though she did not know it at the time, ‘‘the third’’ was beckoning from Mexico. ‘‘Black, black, black is the colour of a Mexican night’’ begins Page’s Mexican diaries (133-26) establishing from the start that Mexico would be the site of ‘‘the dark night of [her] soul’’ (Hand Luggage 81). The Mexican diaries are the record of an unbroken, and increasingly frantic, search for the spiritual sustenance that the sensuous richness of Brazil had been unable to offer her. Often on the edge of despair, Page seeks guidance from a wide variety of sources, including Jung, St. John of the Cross, C. S. Lewis, Gurdjieff, Subud (a spiritual movement originating in Indonesia), Zen, the ‘‘perennial philosophy,’’ and even -- to the horror of Arthur -- Timothy Leary, who was visiting Mexico at the time. Deeply affected by the half-mad surrealist painter Leonora Carrington, during this period Page created her greatest paintings: for example, ‘‘Cosmos’’ (‘‘When Leonora saw it she said ‘I am having a heart attack’’’), or ‘‘And You, What do You Seek?’’ or ‘‘The Garden’’ or ‘‘The Dance.’’ These paintings make the stabs at surrealism in her poetry of the forties and fifties seem like child’s play. Towards the end of the Mexican diaries, Page begins to refer to Idries Shah, but the diaries break off before her actual moment of discovery. It is only in her retrospective comments on this period, and in the poems which were to follow, that the impact of Shah, and of the Sufism to which he introduced her, fully registers. Shah’s version of Sufism, the central mystical tradition of Islam, is much contested by students of Islam, precisely because Shah denies its Islamic roots. He argues that Sufism is a universal mystical tradition which, for historical reasons, found a home in the Islamic world, but which has no deeper connection with Islam than with any other religious tradition. This, in itself, would have attracted Page, because she had no particular interest in Islam or in any other form of organized religion. More important, though, is the inclusive nature of Sufism. Sufism rejects all forms of dualism in favour of Page’s ‘‘Triclopic view’’ of a unified self consisting of nafs (sensation),qalb (understanding) and ruh (spirit). It is for this reason that the greatest spokesmen of Sufism are not philosophers and theologians, but poets. To the uninitiated, their verses can appear to be purely sensuous celebrations of love, wine, music and the beauties of the natural world; but to the understanding eye they embody spiritual truths. The spiritual discipline of Sufism, which Page took very seriously indeed, sanctioned her celebration of the sensuous world and provided her with an intellectual framework for this celebration. To characterize, in a few words, the diverse body of work which follows on ‘‘Cry Ararat’’ would be impossible, but there are certain qualities that stand out. Although relatively few of her poems allude specifically to Sufism (‘‘Leather Jacket’’ is one exception), the series of visionary poems that begin with ‘‘Cry Ararat!’’ (such as ‘‘Another Space,’’ ‘‘Cosmologies,’’ ‘‘The Disguises,’’ ‘‘The End,’’ ‘‘The Flower Bed,’’ ‘‘Invisible Presences Fill the Air,’’ ‘‘Seraphim,’’ ‘‘Spinning’’ and ‘‘The Yellow People in Metamorphosis’’) would be inconceivable without the stillness of spirit which Sufism enabled her to achieve. Even the most intellectually complex of these poems are characterized by the ‘‘pure line’’ Page had prayed for in ‘‘After Rain.’’ They tend to simple diction, free of the verbal knots and intricacies that had characterized most of Page’s earlier verse. And along with these more visionary poems are numerous lyrics (such as ‘‘Gift,’’ ‘‘Beside You,’’ ‘‘Stefan,’’ ‘‘The New Bicycle’’ and ‘‘This Sky’’) of almost haiku-like directness, which register Page’s unending delight in the world around her, a delight which, if anything, increases as she grows older. The simplicity of diction, vividness of imagery and lyric intensity of the later Page have made poems such as ‘‘Planet Earth’’ much beloved beyond the usual circles of readers and students of poetry. I thought their hands might hold me if I spoke. another bird assumes its furled disguise. to call me to clover. small flowers for my crown.